Alex Dowsett (Movistar) took his first WorldTour win since the 2013 Giro d’Italia with a dominant ride on the flat 25km course that was used for the final stage of the Tour de Pologne. The Brit was 22 seconds faster than teammate Jonathan Castroviejo in a 1-2 for Movistar and 39 seconds faster than Primoz Roglic (LottoNL-Jumbo) in third. Tim Wellens (Lotto Soudal) rode safely to take 14th and secure the overall win while top 10 places allowed Fabio Felline (Trek) and Alberto Bettiol (Cannondale) to move onto the overall podium. When he beat Bradley Wiggins in the time trial at the 2013 Giro d’Italia, many believed that Alex Dowsett would go on to become a dominant figure on the international TT scene. However, that never happened and since that breakthrough win he has not won a single WorldTour time trial. That changed today when Dowsett lined up as one of the favourites for the final 25km time trial at the Tour de Pologne. The out-and-back course in Krakow was completely flat, barely had a single turn and was perfectly suited to a big engine like Dowsett. 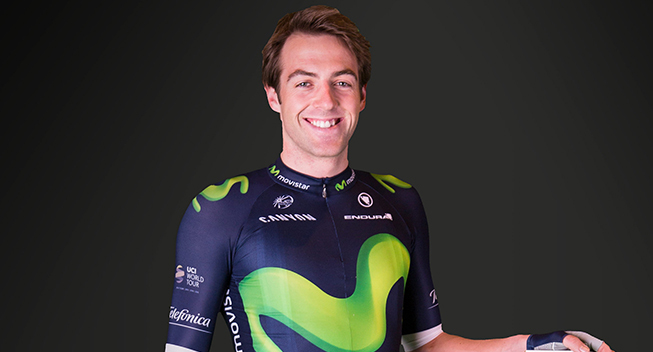 Being a non-climber, Dowsett was far down in the GC and already the seventh rider to hit the course. Unsurprisingly, he was much faster than everybody else and after posting a time of 28.59, he faced a long and nervous day in the hot seat. His big rivals were expected to be Belgian champion Victor Campenaerts (LottoNL-Jumbo), Slovenian champion Primoz Roglic and his own teammate Jonathan Castroviejo. That turned out to be true but none of them got even close to Dowsett’s time. Dowsett probably got an important boost of confidence when Campenaerts missed out by 48 seconds and when Roglic could only do 9 seconds better than his teammate, he just had to wait for Castroviejo. The Spaniard did better than the LottoNL-Jumbo pair but he missed out on the win by 22 seconds in what would ultimately be a 1-2 for Movistar. Ben Hermans (BMC) did surprisingly well to split Roglic and Campenaerts in fourth place. None of the GC riders were expected to challenge Dowsett who could slowly start to celebrate the win while the battle for the overall top spots was on. Tim Wellens went into the race with an advantage of more than four minutes so he just had to get safely around the course in Krakow. He did that well to take 14th on the stage and so took his third overall victory on the WorldTour following the 2014 and 2015 editions of the Eneco Tour. The fight for the other podium place was much closer and unsurprisingly Fabio Felline was the big winner. Being the only real specialist in the top 5, he posted the sixth fastest time and so finished second overall, 4.22 behind Wellens. The big surprise was Alberto Bettiol who had started the stage in fifth overall. The Italian did the time trial of his life to move onto the podium with third place, 4.54 behind Wellens. The losers were Davide Formolo (Cannondale) and Tiesj Benoot (Lotto Soudal) who are far from being specialists. The pair both lost lots of time and slipped off the podium to fourth and fifth respectively. The other winner was Ruben Fernandez (Movistar) who jumped from 8th to 6th while Andrey Zeits (Astana) went the opposite way, with Larry Warbasse (IAM) defending seventh place. Dario Cataldo (Astana) and Davide Villella (Cannondale) completed the top 10. Bettiol won the points competition and Wellens was the best climber. Wellens also won the sprints competition and Lotto Soudal was the best team. With the Tour de Pologne done and dusted, many riders will now return home to prepare for the Olympics. Some will line up at the Tour de Wallonie which starts on Saturday but for many it was the final race before the battle for gold in Rio. With the Tour de France still underway, there is another week of WorldTour racing before the race series takes a five-day break. The next race is the Clasica San Sebastian which takes place on July 30. The mass exodus from the race meant that the start of the stage was delayed by more than an hour before Charles Planet (Novo Nordisk) finally rolled down the ramp under a cloudy and dry sky. He reached the finish in 33.04, thus narrowly holding off the second starter Paolo Simion (Bardiani) who had started one minute later and took the lead with a time of 32.08. Simion led the stage for a few minutes but it was always evident that Dowsett, the 7th starter, would set an early mark. The Brit powered over the flat course in a time of 28.59 that was much faster than the other early starters, dragging Bert De Backer (Giant-Alpecin) into second place in the process. Alexey Vermeulen (LottoNL-Jumbo) rode into a comfortable second place but he was a massive 1.58 slower than Dowsett. Branislau Samoilau (CCC) also had a good ride to slot into third with 31.04. Adam Stachowiak (CCC) made it two CCC riders in the top 4 when he equaled Samoilau’s time, dragging Dennis van Winden into sixth place. Jonas Koch (Verva) slotted into fifth with 31.17 and Michal Paluta (CCC) continued the great day for CCC by posting the 8th best time of 31.43. Svein Tuft (Orica-BikeExhange) was expected to be the first threat for Dowsett but he missed out on the lead by 1.11, slotting into second. Moreno Hofland (LottoNL-Jumbo) had latched onto his wheel and so secured himself a provisional fifth place. Sergio Paulinho (Tinkoff) was briefly in the top 10 but it was his teammate Daniele Bennati who really shone. The Italian proved his return to form by posting the third best time of 31.19. Peter Kennaugh (Sky) had a good ride to make it into sixth with 30.58 but he was soon pushed down by Pavel Brutt (Tinkoff) who was 12 seconds faster. Jack Haig (Orica-BikeExchange) split the pair with a time of 30.47 and Laurens De Plus (Etixx-QuickStep) was also briefly in the top 10 with 31.01. Artem Ovechkin (Gazprom) was the next specialist to hit the course and his time of 30.34 saw him slot into fourth. However, he was soon beaten by four second by Victor De La Parte (CCC) who missed out on the podium by just four seconds. Hugo Houle (Ag2r) made it two Canadians in the top 10 as he slotted into sixth with a time of 30.30 while Michal Kwiatkowski (Sky) had a bad ride with 31.20 which was only good enough for 25th. He was even nearly passed by Maciej Paterski (CCC) who slotted into 11th. Belgian champion Victor Campenaerts (LottoNL-Jumbo) was expected to be a big threat for Dowsett but the Belgian had to settle for second with 29.47. Diego Ulissi (Lampre-Merida) also did well to take 10th with 30.41. Dowsett definitely feared Giro d’Italia stage winner Primoz Roglic but the Slovenian was unable to repeat his win from Italy. However, he was still strong as he slotted into second with 29.38. Giovanni Visconti continued the good day for Movistar by posting the 10th best time of 30.38 but it was Castroviejo that everybody waited for. The Spaniard was the final realistic threat to Dowett but 29.28 was 29 seconds off the mark and only enough to take second. Ben Hermans (BMC) did a fantastic TT to beat his compatriot Campenaerts by seven seconds and move into fourth behind Dowsett, Castroviejo and Roglic but it was Davide Villella (Cannondale) who kicked off the GC battle. However, the Italian could only manage 55th. Dario Cataldo (Astana) confirmed his status as a specialist by posting the ninth best time before Ruben Fernandez (Movistar) did a surprisingly good TT to take 11th. Larry Warbasse (IAM) was expected to be one of the GC winners but 30.39 was only good enough for 14th. Andrey Zeits (Astana) was on a bad day with 31.08 which was enough for 32nd and instead it was Alberto Bettiol (Cannondale) who surprised everybody. The Italian did the time trial of his life to move into seventh with 30.12. Fabio Feline (Trek) was one of the only specialists among the GC riders and so it was no surprise that he posted the sixth best time of 29.48. As expected, Tiesj Benoot suffered in the discipline and he could only manage 30th with 31.01. Davide Formolo (Cannondale) had it even harder as he had to settle for 50th with 31.31, thus dropping off the podium. Moments later, Wellens crossed the line in 14th place while raising is arm in celebration.